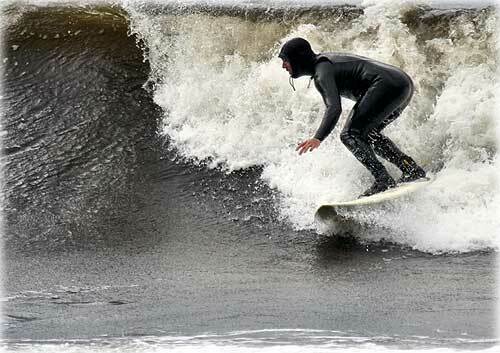 Unusually high waves offered good surfing conditions at Bugge's Beach for this unidentified local. Alaska: Bill Walker rules out write-in candidacy - Bill Walker announced today that he will not be entering the race for governor as a write-in candidate. "I will not be running as a write-in candidate for governor but my commitment to Alaska and the critical issues that caused me to enter this over race one year ago remains strong," said Walker. "I cannot overemphasize the significance of the crisis we are facing as the cost of energy across our state continues to go up while the production of oil on the North Slope continues to decrease rapidly each year. Alaska cannot continue to sit back, wait and study while the window of opportunity for a natural gas pipeline passes us by. The gas is needed to significantly lower the cost of energy across Alaska and to help offset revenues resulting from the decline in oil in the Trans Alaska oil pipeline, which is presently 2/3 empty." Walker says he wants to remain active in the political process and plans to continue educating the public about the All-Alaska Gasline. "As I have said before, there is a rising tide of Alaskans who are fed up with business usual," said Walker. "They want to see a prosperous future for Alaska. I will be exploring ways to ensure that their interests will be represented and their concerns will be heard, not ignored." Alaska: Prosecutor in Ted Stevens case commits suicide By PETE YOST (AP) - A Justice Department prosecutor killed himself while under investigation over whether he and other attorneys in the prosecution of Sen. Ted Stevens acted improperly in the case, officials said. Nicholas A. Marsh, 37, committed suicide on Sunday, two years after being part of the Justice Department team that convicted Stevens on corruption charges that were eventually thrown out. Marsh's suicide was confirmed by his lawyer, Robert Luskin. "I think Nick loved being a prosecutor and I think he was incredibly fearful that this would prevent him from continuing to work for the Justice Department," Luskin said Monday. "It's incredibly tragic after all this time when we were on the verge of a successful resolution." Fish Factor: Record prices; Genetically modified salmon; & more... By LAINE WELCH - Halibut prices have remained through the ceiling since the fishery opened in mid March. Restaurateurs and retailers all say the same thing this year: People want Alaska halibut and they're willing to pay for it. In recent years it's not uncommon for prices to top $5/lb for halibut at major ports, and that has been the case this year. Prices to fishermen at Kodiak last week ranged from $5.10-$5.35 and $5.60 per pound, depending on fish size. Prices were even higher at some ports. So far, 87% of Alaska's halibut catch has crossed the docks, with just over 5 million pounds remaining in this year's 40.3 million pound catch limit. Top halibut ports for landings are Homer, Kodiak, Seward and Juneau. Besides halibut, Alaska longliners also are getting record prices for sablefish (black cod) - for example, $5.20 /lb for small sizes, and topping $7/lb for 'seven ups.' For sablefish, 83% of the catch has been taken, with 4.3 million pounds remaining in the 25 million pound quota. Seward and Sitka are the top ports for sablefish landings. Alaska's biggest fishery - pollock - will yield a bigger catch next year. As predicted, summer surveys showed the stocks appear on track for good recruitment into the fishery. At an industry/agency plan team meeting last week, "back of the envelope calculations' suggested a catch of between 1.1 and 1.3 million metric tons of Bering Sea pollock in 2011. Alaska's salmon catch so far is approaching 165 million fish, compared to the forecast of 137 million salmon. Industry insiders predict the dock side value of the catch could approach $400 million. A panel of experts has urged the Food and Drug Administration to require more studies before approving genetically modified salmon for America's dinner plates. The fish would be the first animal product to get the GM nod for human consumption. Alaska: Long-Delayed Opening of Juneau Mine Celebrated - Attorney General Dan Sullivan today joined a group of public officials at the opening of the Kensington gold mine 45 miles northwest of Juneau. The Department of Law played a key role in ensuring that the mine could open. The state intervened to challenge a lawsuit brought by environmental groups to shut down the mine. The state and Coeur D'Alene Mines Corp. took the matter to the U.S. Supreme Court, even after the federal regulatory agency with jurisdiction over the project declined to do so. "The opening of the Kensington mine, with the creation of hundreds of well-compensated jobs, demonstrates why the State of Alaska should not hesitate to intervene in cases that threaten our ability to develop our resources responsibly," Sullivan said. "When the state brings its legal expertise to bear on these important matters, we often prevail." In the past year, the Department of Law has initiated or intervened in about a dozen cases in which resource development projects in Alaska have been put at risk. Alaska: Where is Stella? Cold Case Unit Seeking Clues - Stella Evon was 17 years old when she last walked out of her sister's apartment in Bethel, Alaska. Standing just shy of five feet tall, the young Yupik Eskimo girl vanished without a trace in the early morning of September 26, 1996. As the years passed, Evon's sister continued to look for her. She isn't the only one searching for answers. The Bethel Police Department filed its case on Evon with the Alaska State Troopers' Cold Case Unit last fall. It has since caught the attention of Cold Case Investigator Jim Gallen. "She didn't just disappear. You don't go missing in a place like Bethel without someone knowing something," said Investigator Gallen. "My hope is that whoever has the information we need to find Stella Evon comes forward so we can bring her family peace." Post your question(s) for the candidates as a group and read the responses from the candidates. Candidates are encouraged to participate and address questions from the public.